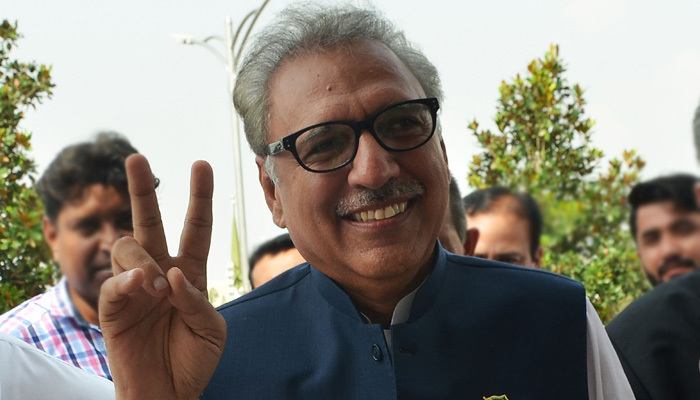 LAHORE: Dr Arif Alvi, one of the founding members of Pakistan Tehreek-e-Insaf and close aide of Prime Minister Imran Khan was elected the 13th president Tuesday with a clear majority. A research by the "Jang Group and Geo Television Network" reveals some interesting facts about the new president whose complete name is Dr. Arif ur Rehman Alvi. By assuming Presidency at the age of 69 years, one month and seven days, Dr. Alvi (born July 29, 1949), is the third Pakistani President to hold keys to this prestigious office at a rather ripe age of 69, research shows. Prior to Dr. Arif Alvi, a Pakistan People’s Party stalwart, Fazal Elahi Chaudhry and PML-N’s Muhammad Rafiq Tarar had also become Presidents of Pakistan at the age of 69. Fazal Elahi Chaudhry (1904-1982) had won keys to President's office at he age of 69 years, nine months and 13 days on August 14, 1973. He had served from 1973 until 1978. Muhammad Rafiq Tarar (born November 2, 1929) was elected as the ninth President of Pakistan and took oath to his office on January 1, 1998, hence becoming President at the age of 69 years and approximately two months. He had served from 1998 until resigning the office in June 2001. Two other Pakistani Presidents, Messrs Mamnoon Hussain and Ghulam Ishaq Khan had become heads of state at 73 plus. In September 2013, Mamnoon Hussain, had become president at age of 73 years, six months and six days. He was born on March 2, 1940, or just 21 days before the historic Pakistan Resolution was passed in Lahore to demand the partition of undivided India. During the last 62 years, since the country had its first-ever President Iskander Mirza, Mamnoon Hussain thus remains the second oldest Pakistani head of state to be elected or appointed, after the late Ghulam Ishaq Khan (January 20, 1915-October 27, 2006), who had assumed this august office on August 17, 1988 at the age of 73 years, 9 months and 27 days, to be more precise. Dr. Alvi is the second dentist ever in world history, after Turkmenistan's Dr. Gurbanguly Berdimuhamedow, to head a state or a government.